The Schwalbe Durano is a hard wearing and puncture resistant tire with a low rolling resistance and excellent grip in all conditions. A great choice for recumbent riders looking for a high-performance winter training tire. Features include a RaceGuard flat resistant belt and water dispersing grooved pattern. 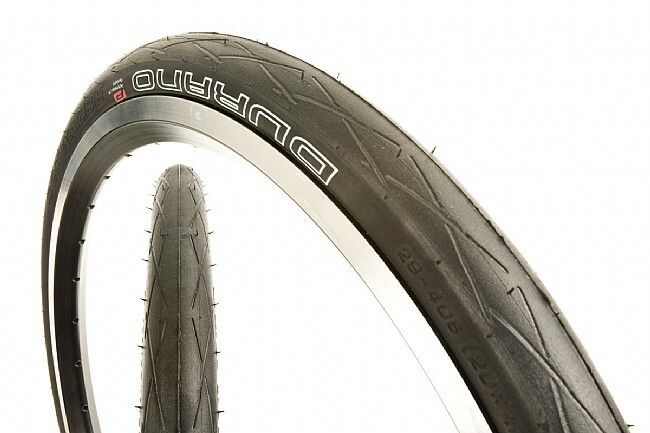 This version of the Schwalbe Durano is available in 20" x 1 1/8" (28-451 ISO). Wire bead. 255g, 115psi max. This is also a common size used for recumbent bicycles. Also used on some children's bikes. 20 Inch Sizing Note: There are two sizes commonly referred to as "20 inch" which are not interchangeable. This size features a 451mm bead seat diameter (to ensure compatibility this measurement should be printed somewhere on your existing tire or rim). The width measurement for the 451 size is almost always expressed in the form of a fraction (e.g. 1 1/2), not a decimal (e.g. 1.5). If you are unclear about which size fits your 20 inch rim please contact us. I went 3000 miles on the previous Durano on my Vortex in AZ. Even the old tire holds the road well. Went thru a wetoily turn with about an inch slippage, two riders behind me crashed. These tires are really the only ones that are compatible with my Bike Friday rims. Good thing that they are very well made. I've taken them all over the US while I'm on the road at work. Cannot remember more than a couple of flats in 10 years of riding. Never really see them on sale. But under $40 is a reasonable price. I've been through 4 sets of these tires over the last several years. It seems I get about 1 year of riding out of a set due to the smaller wheel size 451 your tires wear out faster than on a full-sized bike. As far as tires at this size go, there are very few choices and this is really the best all-around choice for touring, road riding, or commuting. I've found them very durable and reliable. Not too heavy either which is a plus. These are the only tires i have found that fit my Bike Friday Pocket Rocket rims. 451mm are pretty rare I guess. That being said, these tires are great and I've ridden many miles with them. They are tough tires with quality handling characteristics. Bike Friday always has them in stock so why go anywhere else? I have used these exclusively for my recumbents for the past several years. I did have a bubble on one recently, but I took it to my bike shop and they replaced it under warranty. Other than that, I have never had issues and they seem to have decent puncture resistance and provide traction and a smooth ride. This is the best tire I found for my 2 recumbents. Very fast. Has good grip in the rain. Their customer service is the best I ever experanced. I love this product. Its the only 26" and 20" inch tire I'll buy. So far for a high pressure, folding bead tire. It has the best puncture protection I found. I buy these all the time. I found their good for 3000 miles. Unless you cut them on somthing nasty. Pinch flats are always a concern on tires this size. But these hold up great. I use these tires on my Bike Friday folding bike for commuting and long weekend rides. The first thing I noticed when riding on these tires is how efficiently they absorb the road vibration. I was using Kenda tires before and got used to a harsh ride when the road got a little bumpy. These give a smooth ride even when inflated to 100 psi. They also have great traction. I take turns confidently even in wet weather.. If they wear well, they will be the best 20" tire I've found yet. 4 of 8 customers found this review helpful.